Book your pet’s appointment today. At Parksville Animal Hospital our mission is to give your pet the best care possible. Whether it is a first visit, an annual checkup or a surgery we try to make his or her stay at our hospital completely stress free. Every member of our small but knowledgeable staff is a pet owner so we fully understand your concerns. We take great pride in the fact that our patients are happy to come to their appointments and gladly take the cookies and care that we offer. 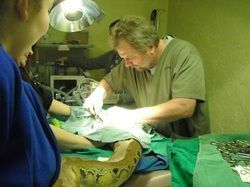 Veterinarian and owner of the hospital since February 2010, Dr. Simon graduated from the University of Veterinary Sciences in Budapest, Hungary in 1984. From 1989 to 1992 he was assistant professor at the department of pathology of the same university. This background in pathology still helps him in his day to day work. Dr. Simon has been fully licensed in Canada since 2005. He has special interest in surgery, geriatrics, cardiology, and clinical pathology. Prior to moving to Parksville with his family, he was an Associate Veterinarian at the Lethbridge Animal Clinic in Alberta for 5.5 years. The Simons are pet owners themselves. They have an Australian Shepherd (Zippy), four cats Cica (Kitty), Tope, (Midget) Kismacska (Little Cat), Stompy, and a bunny. Laszlo loves sea kayaking, scuba diving, swimming, hiking and he shares all these passions with his family. Gabriella is the co-owner, business manager, and Veterinary Technician of the hospital and wife of Dr. Simon. She has been in the industry in the past 30 years or so. Gabi enjoys getting to know all of the patients and their owners, and has special interest in pet nutrition and client education. In her spare time she is a book worm, loves hiking with her family and Zippy, practicing ballet and yoga and most of all cooking and baking big traditional Hungarian meals for her family. She moved over to the Island and joined us in November 2011. Diana graduated from the Thompson Rivers University Animal Health Technology Program in Kamloops in 2018. Diana enjoys spending her time outdoors with her fur baby Caoimhe, as well as hiking, camping and swimming. Tiffany is the newest member of our team, and she is thrilled to be pursuing a career working with animals. 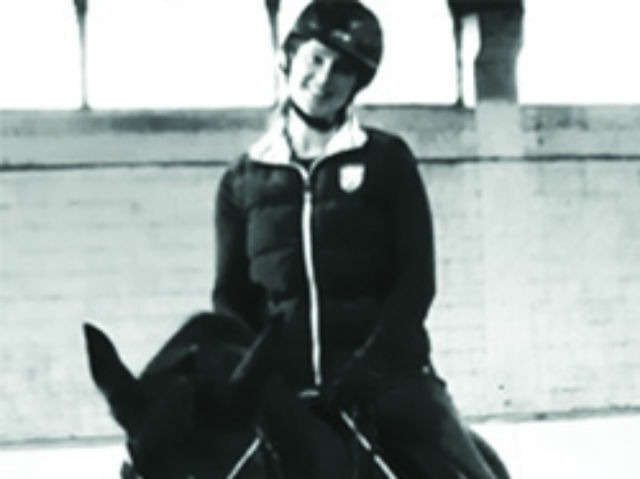 After nearly 2 decades spent in Vancouver where she successfully managed equine facilities while juggling a busy career as an insurance broker, she is happy to return to her roots. 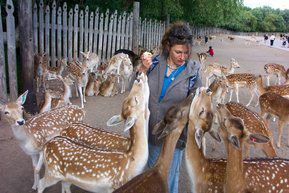 She has spent a lifetime surrounded by, and devoted to, animals. She is happy to be back on the island, near family and in the country where she lives with her dog, 2 horses, cat, and counting…. Erin grew up in the Qualicum Beach area and graduated from Vancouver Island University 2009 with a Bachelor of Science, Major in Biology. 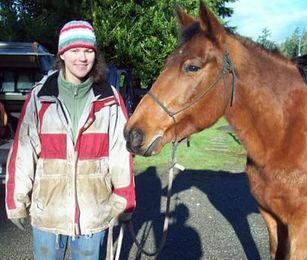 She then moved to Victoria where she worked in a small animal clinic as a veterinarian assistant for 8 years. 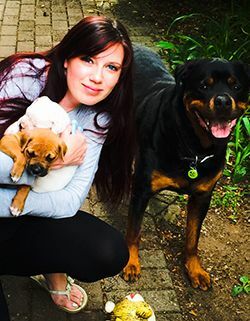 She has now moved back to the Mid-Island area and joined our practice March 2018.She has a passion for small animal nutrition and loves discussing diet options with clients. She still attends as many nutritional seminars as possible to help keep her current on the exciting innovations happening in pet nutrition today. Outside of work, Erin tries to spend most her time at the barn hanging out with the horses. For several years now Parksville Animal Hospital has been a part of our Spay & Neuter project at Qualicum Cat Rescue. Spaying and neutering hundreds of cats and kittens. Both Dr. Simon and his wife Gabriella are caring people who go out of their way to help the people we send to them. Dr. Simon is a very experienced and thorough veterinarian, ensuring the kittens and cats that are a part of our project are tested for disease, treated for worms and fleas as well as spay and neutered. Dr. Simon has also done emergency surgery for Qualicum Cat Rescue when we desperately needed help, and kept the cost of his services down, which we are very grateful for. We deal with a few other clinics in the area, and while they too are very good, the administrative excellence that Gabriella brings to Parksville Animal Hospital can not be overlooked. As we continue our Free Spay & Neuter project in our area, we look forward to continuing our relationship with Parksville Animal Hospital, Dr. Simon and all his very efficient and caring staff. I have been a client of Parksville Animal Hospital for 3 years. As I am a dog breeder I have had many occasions to use their services! They have always been professional, kind and readily available whenever I have needed them. My dogs happily walk into their office and that speaks volumes to how they feel about Dr. Simon and the staff! As an animal lover, breeder and rescuer, I have dealt with lots of different veterinarians in the past. To me, what I look for in a vet is a genuine love for animals, a qualified and competent staff who are able to work with difficult breeds, temperaments and a clean, tidy facility, which Parksville Animal Hospital is. Parksville Animal Hospital has been amazing, from basic routine things, vaccines, microchips, health exams and tests to emergency c sections, ultra sounds, X-rays, stomach surgeries and many, many more. Their staff members are all so amazing and helpful; I never worry when my dogs are in their care. I have taken several very nervous and fearful rescue dogs to them and Dr. Simon has got down on his hands and knees so the dogs felt more comfortable. I really appreciate the time Dr. Simon takes to explain certain things to me and in terms I can understand. I know and trust that when my dogs are hospitalized overnight that someone is actually there monitoring them. I also really like that you know what vet you are seeing every time, and Dr. Simon’s dedication to his practice. I would highly recommend Parksville Animal Hospital to anyone who has pets and is looking for a veterinarian who loves animals. My 2.5 years old golden retriever, Amber, and cat, Buddie, have been patients of Dr. Simon and staff for a few years now. I trust them completely with the care of my beloved pets and recommend them to my friends and other animal lovers I chat with. I am able to phone anytime for information about pet care and am always pleased with their advice. Dr. Simon even gave me a long distance consultation when my daughter's cat was ill and we were unable to get a vet. He spent over a 1/2 hour going over lab results etc. with no cost to me. My dog loves going to visit there anytime as she feels safe and comfortable. I am glad to find a vet that I rely on and is available when needed. It's not a fancy expensive office but a very efficient affordable one.